A RavenDB Cluster is one or more machines (nodes) that have been joined together, working to achieve the same goal. Using the Raft consensus protocol, the cluster distributes work among the various nodes, handles failures, recovery, and more. 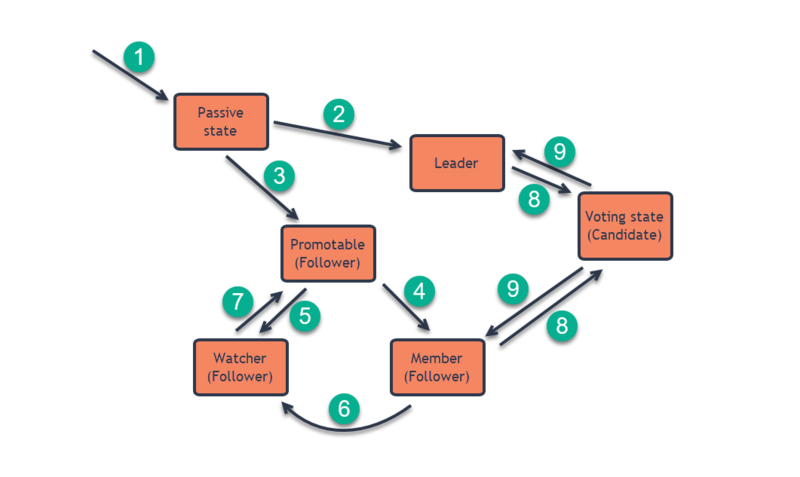 The cluster Member nodes elect a Leader - a node that manages the cluster state. 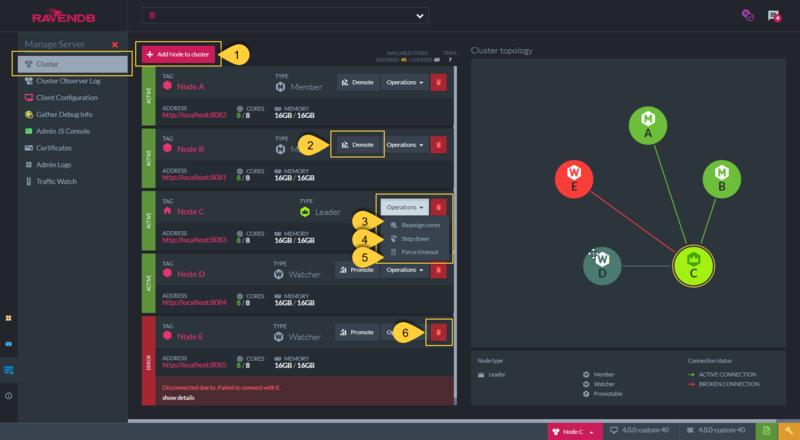 This view shows your cluster's current state and structure. Memory used by the node out of total memory installed on this node's machine. The default configuration for the RavenDB cluster is that each node expects to get a heartbeat from the cluster leader every 300 milliseconds. Clicking 'Force Timeout' will trigger actions on the node as if it did Not hear from the Leader in this time period. Remove the node from the cluster. Note: The server on this node is not shut down. as long as a majority of the nodes are functioning and can talk to one another. For example, the decision to add a database to a node will be either accepted by the entire cluster (eventually) or fail to register altogether. The Leader maintains the database topology, which is fetched by the clients as part of their initialization. Cluster-wide operations can't be done when the Leader is down. A Watcher is a non-voting node in the cluster that is still fully managed by the cluster. A Watcher can be assigned databases and work to be done. as these nodes don’t take part in majority calculations and are only there to watch what’s going on in the cluster. So cluster decisions can be made with a small majority of nodes while the actual size of the cluster can be much higher. Promotable is a pre-state before becoming a Watcher or a Member. Cannot make cluster decisions (i.e vote for leader, enter a new Raft command to the log). Updated by the leader to the latest Raft state. 1. A new server/node will start as Passive, meaning it is not part of any cluster yet. 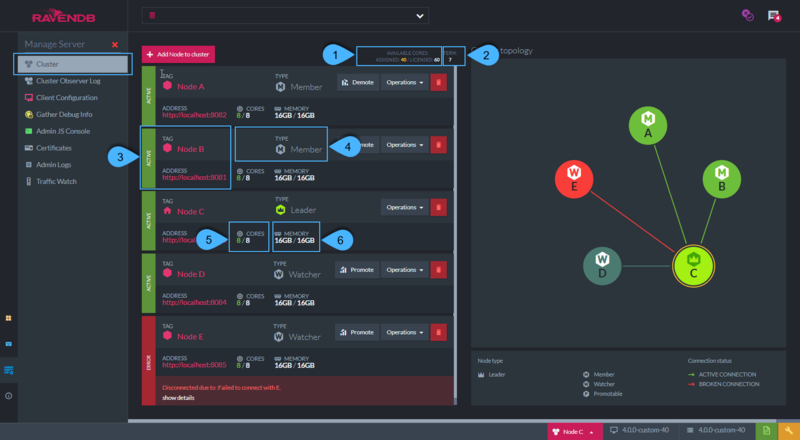 Learn how to add a node to a cluster in: Adding a Node to a Cluster. 4. A node will become a Member of the cluster if not specified otherwise. 5. A node will become a Watcher if specified when adding the node. 6. A Member can be Demoted to a Watcher. 7. A Watcher can be Promoted to a Member. It will first become Promotable and a Member thereafter. 8. A Member (a regular Member or a Leader - but not a Watcher) can become a Candidate when a voting process for a new Leader takes place. 9. When the voting is over and a new Leader is elected, one node will become a Leader and the rest will go back to being Members. A Watcher does not take part in the voting process. During elections, a Watcher enters a waiting state until elections are over. Operations in RavenDB are usually divided into cluster-wide operations and internal database operations. Any action/decision that is made at the cluster level and needs a Raft consensus (so that the cluster is always kept consistent). This decision will either be accepted by the entire cluster or completely fail to register. Note: An action is accepted by the entire cluster if a majority of the nodes have approved that action - if a majority of the nodes isn't available, we can’t proceed.